SEATTLE--(BUSINESS WIRE)--Oct. 25, 2017-- (NASDAQ: AMZN)—Amazon today introduced Amazon Cloud Cam, an intelligent indoor security camera that lets you keep track of your home at an affordable price—check on the pets from work, monitor the front door while traveling, or look in on the kids’ room from the kitchen. Cloud Cam features 1080p Full HD resolution video, night vision, two-way audio, a wide viewing angle, and activity clips from the last 24 hours via the Amazon Cloud Cam App—all for only $119.99. Cloud Cam also is available for under $100 each via a two-pack for $199.99 or a three-pack for $289.99, making it easy to outfit your entire home. Cloud Cam is available for pre-order at www.amazon.com/CloudCam and will begin shipping to U.S. customers on November 8. 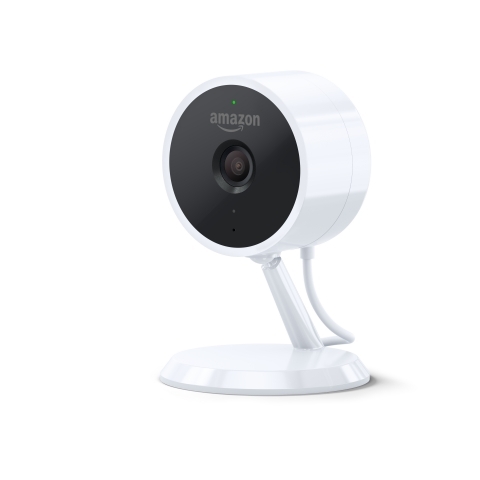 Cloud Cam is also the first security camera to support Amazon Key, a new service that enables in-home delivery and secure home access for guests and service appointments, without anyone having to be home. Using Cloud Cam and the free Amazon Key App, you can track each delivery with notifications, watch the entry happen live or view a recorded video after delivery is complete. You can also get notifications when your guests unlock your door. The Amazon Key In-Home Kit, which includes Cloud Cam (Key Edition) and a compatible smart lock, is available exclusively to Prime members—learn more at www.amazon.com/key. Cloud Cam works seamlessly with Alexa on Echo Show, Echo Spot, Amazon Fire TV devices, and Fire tablets. Just say, “Alexa, show me the [camera name]” to easily see the feed from anywhere in the house. Or use the free iOS or Android app to see your Cloud Cam on the go. The advanced motion detection and computer vision technology provides customizable notifications in the Cloud Cam App, so you only get the alerts that matter to you. When activity is detected, Cloud Cam sends a mobile notification and stores the clip securely to review. With intelligence that lives in the AWS cloud, over time you will see more advanced detection, alerts, and other new features become available in the service and on the camera itself, such as advanced audio alerts or pet detection, without having to purchase a new device. Cloud Cam comes with the essentials for keeping an eye on your home, including access to the last 24 hours of clips, which are stored securely in the AWS cloud and support for up to three cameras. With a subscription, you can support up to 10 cameras, get additional storage for video, and have unlimited downloads and shares of video clips. Each subscription also offers Person Detection, which flags human activity instead of general motion (like a pet walking), and Zones, which lets you indicate certain areas of your home with motion that you want ignored (like a ceiling fan). Customers can try any subscription free for 30 days. Cloud Cam also features two-way audio—using the Cloud Cam App and the device’s built-in microphone, tell your dog at home to stop barking or let your family know you’re leaving work. You can also use two-way audio on your Echo Show or Echo Spot. Cloud Cam’s night vision automatically activates when needed and features eight infrared LEDs so the whole scene is clearly visible, even in the dark. Cloud Cam is designed to fit in any part of your house—freestanding or mounted, just plug it in, download the free Cloud Cam App for iOS, Android or Fire OS, and get started. When the green LED light is on, you know your camera and microphone are on. When you turn the camera off, the green light goes off as well to let you know that the camera and microphone are both electrically disconnected. You can pre-order Amazon Cloud Cam for $119.99, a two-pack for $199.99, or a three-pack for $289.99 starting today; it will begin shipping to U.S. customers on November 8. You can also order a bundle of Echo Show plus Cloud Cam for $299.98. For more information, visit www.amazon.com/CloudCam.